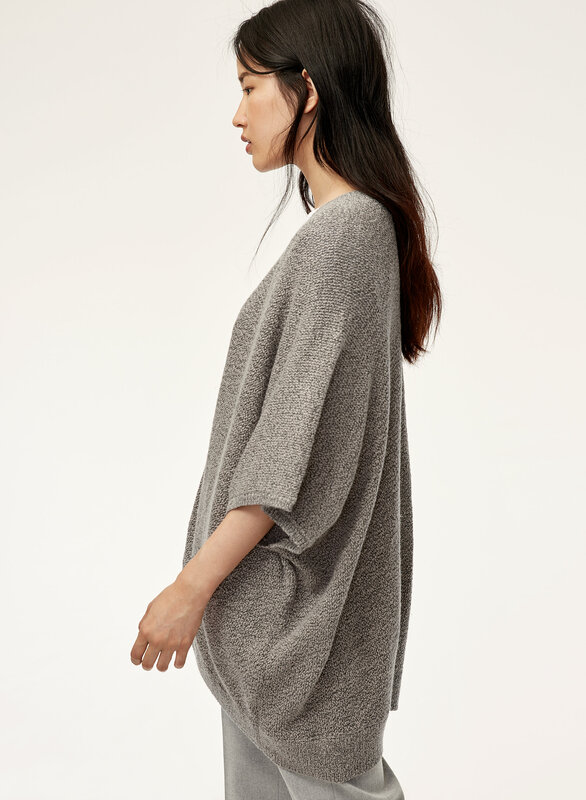 This oversized sweater is knit with a cotton-blend yarn in a textural purl stitch. 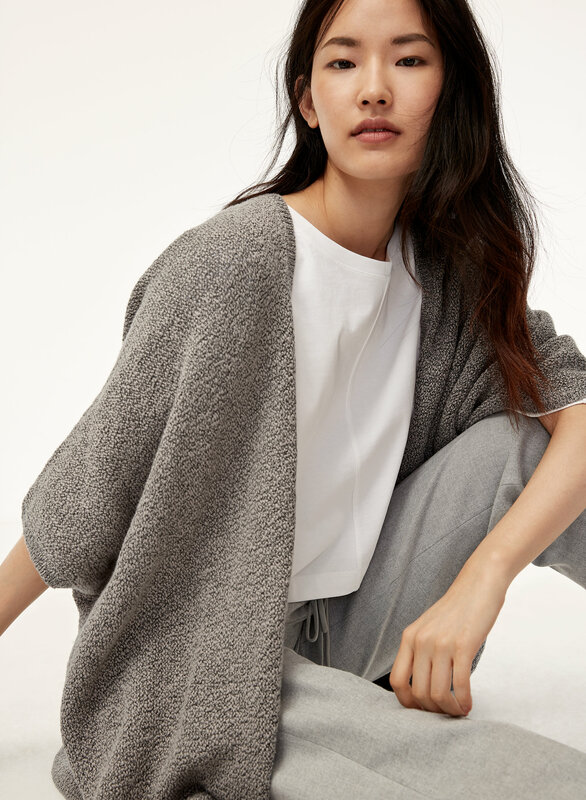 The cape-inspired silhouette makes it easy to layer. Needed to update my classic and love the length! This sweater is so cozy, and drapes my body in a flattering way. A must have for the office. 5'3" and 120lb, I am usually XS in sweaters/coat, S in slim/classic fitting tee shirts, but ordered xxs based on how large it looked on the model and I'm glad I did. Color ashen bp is multicolored warm gray that goes well with my neutral-fair asian skin tone. I love love the cape, I own 3 and I get a lot of compliments every time I wear them, I give them 4 starts just because when brand new they have a lot of lint that I literally have to vacuum to get rid of it otherwise it sticks all over my other clothes, but once is gone it is perfect. I really recommend to not just get one but a few colours! I love how this cardigan fits. It is oversized but just enough that it doesn't look awkward on my petite body. 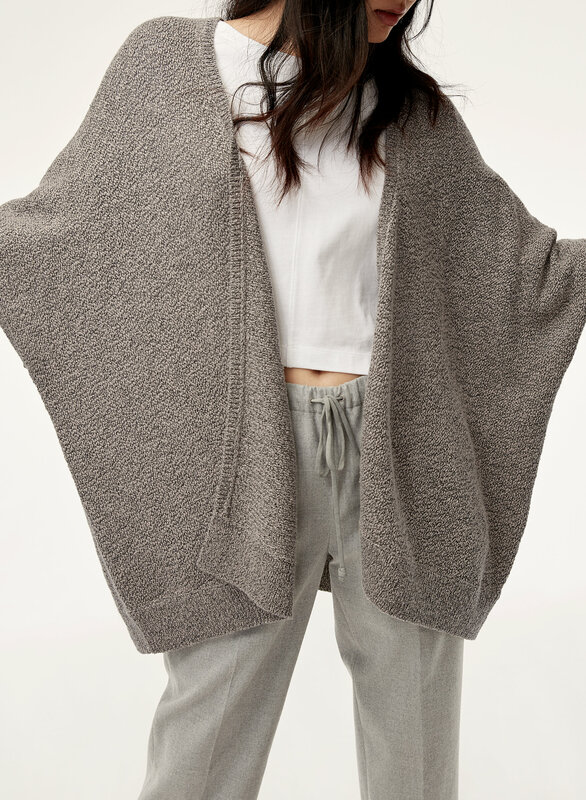 This cardigan can also be worn dressed up or down which is a pro in my opinion. Only con is there is so much lint that comes off and stays on your pants, but it is not a huge hassle. I would definitely recommend. Beautiful but lints on everything! It is beautiful and exactly as described but it lints on everything even after being washed. I ordered something I thought was the colour “ natural” but what I received was black and white. I already had a taupe coloured one from before so knew the size. Such a great comfy, stylish sweater, love it so much! I love this cape! It’s so soft and is beautiful touch to add a bit of warmth to any outfit! Great sweater small size will fit most. Sits well and doesn't slide off shoulders. Great look - sheds like crazy! I bought this with the Cebu pants, and tried them on both when they came in the mail. The moment I put it on, the navy Cebu pants were COVERED in fuzz and lint. I find this weird because my best friend has the Ionic as well, and it doesn't shed at all. I will be trying every possible option to decrease the lint because otherwise it's an amazing piece, I love the colour (ashen), and it's super comfy. Works with almost any look! I'm normally a Medium but I got this in an XS/S. I would almost recommend a size smaller depending on how "baggy" you like the look. I'm 5'4 and 136 lbs. This is my second one, I loved it so much I had to replace it! Loving the look this iconic cape gives me. It is casual and elegant. The product is quite disappointing. Lots of dust and pills came out of the sweater. I didn’t expect that at all. For how much I paid, I expect higher quality than this. Not looking forward to purchase another one. So comfy and looks nice over leggings and a tank top. The perfect cover for an evening with friends after eating too much food! Ha!! The size guide is letting me choose TRUE to SIZE - but it actually is slightly larger than I expected. All good - still looks good! Love the look of this cape. But the material gives off lots of lint. My black tank was white within minutes of having it on. 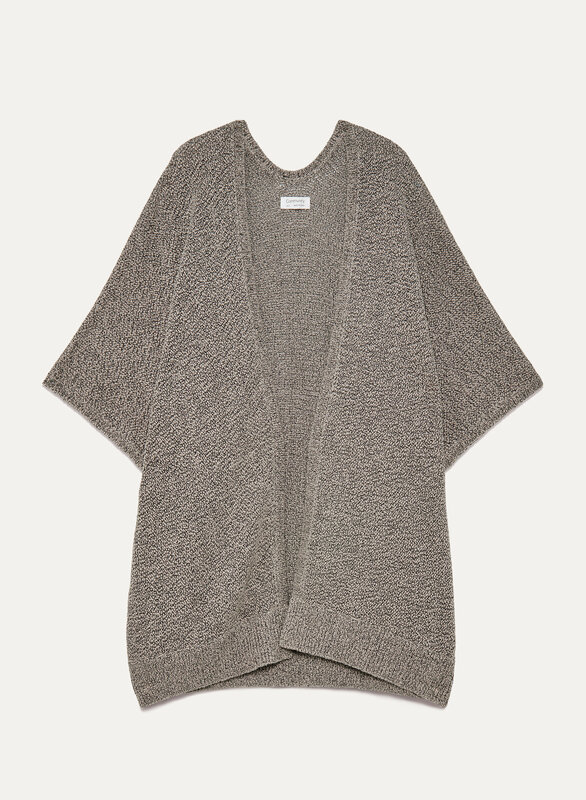 Love this sweater cardigan and perfect for layering for cold weathers. Comfy cozy and full of class!! Love this cape. It’s a versatile and important part of my wardrobe. Love love love it.... that’s why I have 3 of them! Great sweater, perfect loose fit. Love the color. Great look. 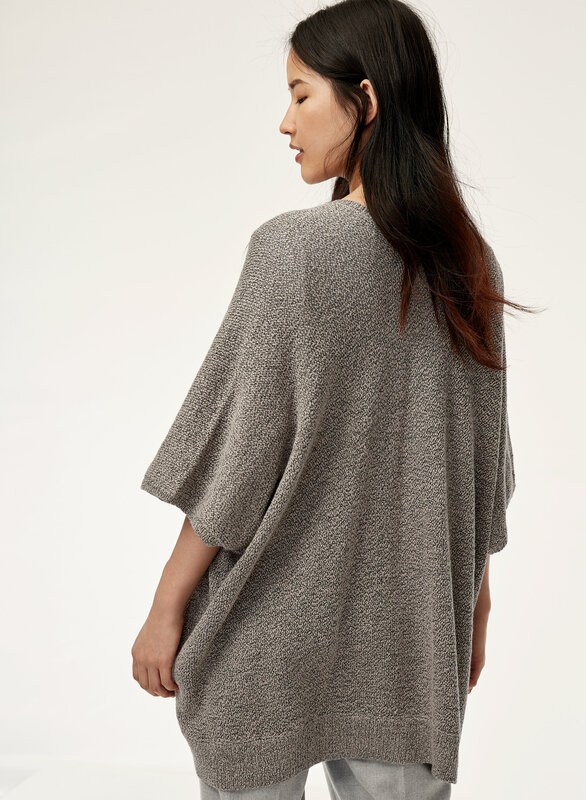 I love this cape- so versatile! I wasn't sure about this item when I ordered it online as I wasn't sure how it would look on but the more I wear it, the more I love it! I get compliments on it almost every time because it is somewhat unique and also super comfy. My only (minor) complaint it that the ends of the sleeves start to roll up a little throughout the day as you are wearing it. It also bunches up a little under a jacket. Other than that, super happy with my purchase. Beautiful and comfortable! I received so many compliments when I wore it. So tempted to get another one in a different colour! I got the M/L. I love the community cape ! I have it in every colour and no matter what the occasion is, this cape always looks good.